Animal consciousness, or animal awareness, has been actively researched for over 100 years, but there has never been a agreement among scientists wether there is an animal consciousness or not, mainly because the problem of other minds. As the field of consciousness research evolved and as new techniques and strategies for human and non-human animal research have been developed, the question has been answered last year. Francis Crick, an English molecular biologist, biophysicist and neuroscientist, co-discovered the structure of the DNA molecule in 1953, together with James Watson. Francis Crick, James Watson and Maurice Wilkins were jointly awarded the 1962 Nobel Prize for Physiology or Medicine for their discoveries. In 1994, Francis Crick published the book The Astonishing Hypothesis (The Scientific Search for the Soul) about consciousness. In Februrary 2003, Francis Crick and Christof Koch published A framework for consciousness in the Nature Neuroscience magazine. The same year, one year before his death, Francis Crick was one of 21 Nobel Laureates who signed the Humanist Manifesto, published by the American Humanist Association (AHA). In July 2012 took place the first annual Francis Crick Memorial Conference at the University of Cambridge, UK. The upshot of the meeting was the Cambridge Declaration on Consciousness signed by Christof Koch, David Edelman, Philip Low, Diana Reiss, Bruno van Swinderen and Jaak Panksepp. 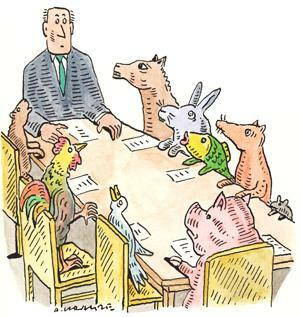 The related cartoon about animal consciousness, drawn by the Polish-born, British cartoonist Andrzej Krauze, was published in the NewScientist article Animals are conscious and should be treated as such, edited by Marc Bekoff. This entry was posted in Science & Philosophy and tagged consciousness by Marco Barnig. Bookmark the permalink.